Pope Saint Pontian or Pontianus, was pope from July 21, 230 to September 29, 235. Sentenced to exile during a persecution, he was the first pope to abdicate the office. He is best known, however, for his death in the mines together with his adversary, the antipope Hippolytus, who, along with Pointian, was later declared both saint and martyr. Pontian was not directly criticized by Hippolytus, who had condemned his predecessor, Callixtus I, as a heretic, but it is not known whether Pontian and Hippolytus ever reached the point of holding communion with each other. During Pontian's reign, a Roman church synod, over which he probably presided, condemned the teaching of the African theologian Origen for heresy. In 235, Pontian and other Christian leaders, Hippolytus among them, were exiled by the emperor Maximinus Thrax to hard labor in Sardinia. Rather than leave the office of bishop of Rome unattended, Pontian resigned in September of that year and was succeeded by Pope Anterus. The congregation of Hippolytus was eventually reconciled with the main body of the Roman church but it is uncertain at what point this occurred. Pontian died not long after his exile, either on Sardinia itself or the neighboring island of Tavolara, probably as a result of being forced to work in the mines. His remains were later broughtback to Rome by Pope Fabian and buried in the Catacomb of Pope Callixtus I. His epitaph was rediscovered in 1909 in the crypt of Saint Cecilia, reading PONTIANOS, EPISK ("Pontianus, bishop"). The inscription MARTUR ("martyr") had been added in another hand. Pontian's feast day was originally November 19, but he is now celebrated jointly with his erstwhile former adversary and rival, Saint Hippolytus, on August 13. According to the Liber Pontificalis Pontian was born in Rome, and his father was named Calpurnius. The Liberian Catalogue of the popes is able to add several specific details not available in the biographies of earlier bishops of Rome. According to this account Pontian was made pope July 21, 230, and reigned until 235. One of the most notable known features of his episcopacy was the continuing schism of Hippolytus, the first antipope and later saint. Hippolytus had disagreed with two earlier popes, Zephyrinus and Callixtus I over their toleration of Sabellianism, a trinitarian doctrine which declined to recognize distinct "persons" in the Trinity, seeing the Father, the Son, and the Holy Spirit more as operational modes of the one God. Hippolytus especially blamed Zephyrinus' deacon Callixtus for this policy. When Callixtus then succeeded Zephyrinus and pope, Hippolytus denounced him as a heretic—both for his trinitarian views and for his policy of forgiving sinners guilty of serious crimes like adultery—and formed a rival congregation, becoming the first antipope. His reign in opposition to Callixtus lasted through the succeeding pontificates of Urban I (222–230) well into that of Pontian (230–235). Scholars are divided as to when Hippolytus was reconciled with the Roman church. Catholic tradition holds that near the end of Pontian's term, Hippolytus and his schismatic group found accord with Pontian and were accepted back into the church. However, it is also possible that the schism persisted until both the pope and the antipope were exiled, with the two congregations uniting once the schismatic party's leader was out of the picture. In this version of events, the reconciliation would have taken place either during the brief reign of Anterus of that of Fabian, who caused the body of both the form pope and the antipope to be given a dignified burial in Rome. Pontian probably presided over the Roman synod which condemned the writings of Origen, the great Alexandrian speculative theologian and biblical scholar. It was also during Pontian's episcopacy that a Roman synod condemned certain teachings of the great African Christian writer Origen. It is likely that Pontian presided at this council, which, according to Jerome (Epist. 33, to Paula), upheld the decisions of an Alexandrian synod against Origen in (231-2). Who has ever managed to read all that he has written? Yet what reward have his exertions brought him? He stands condemned by his bishop, Demetrius, only the bishops of Palestine, Arabia, Phoenicia, and Achaia dissenting. Imperial Rome consents to his condemnation, and even convenes a synod to censure him, not—as the rabid hounds who now pursue him cry—because of the novelty or heterodoxy of his doctrines, but because men could not tolerate the incomparable eloquence and knowledge which, when once he opened his lips, made others seem dumb. Although it is not known exactly what the Roman synod in Pontian's time said regarding Origen, one of Origen's ideas was of the pre-existence of souls. In his own time, however, it was not deemed heretical to promote this idea. Origen concluded that human souls exist prior to their connection to earthly forms in the spiritual world with God. He also doubted the resurrection of the physical body, speculated about the life of the stars, and wondered whether heavenly bodies possessed souls. Origen's most widely condemned doctrine, however, was his teaching of universal restoration (apokatastasis). He likened the Creator to a divine teacher, who could not fail, in the long run, in properly instructing its students. He thus concluded that, in time, all humans would be restored to their former sinless status, becoming perfect and living in the presence of God. In his view, this restoration included all souls, not just humanity, but evil spirits, fallen angels, and even Satan. 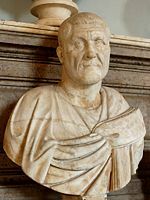 Emperor Maximinus Thrax reversed the relatively tolerant policy of his predecessor Alexander Severus, instituting a persecution of the leaders of the Roman church, whom he considered enemies of the state. The Island of Tavolara off the coast of the much larger Island of Sardinia. Tradition holds that it was here that Pontian spent his final days at hard labor. In 235, in the reign of Maximinus the Thracian, the Roman church came once again under persecution. The policy was directed chiefly against the heads of the Christian community, rather than against the rank and file. Its first victims were both Pontian and Hippolytus, a fact which argues for Hippolytus still serving as bishop of his own congregation. They were banished to the island of Sardinia, probably forced to do hard labor there in the mines. To make the election of a new pope possible, Pontian resigned September 28, 235, according to the Liberian Catalogue. Consequently, Pope Anterus was elected in his stead. Whether just before this, during Anterus' brief reign, or afterward, the congregation of Hippolytus was reconciled to the Roman church, bringing the schism which he had caused to an end. How much longer Pontian endured the sufferings of exile and harsh treatment in the Sardinian mines is unknown. The Liber Pontificalis, states that he died in consequence of the privations and inhuman treatment he had to bear, and while this source is not generally reliable about the martyrdoms of the early popes, in this case there is no reason to doubt its testimony. According to another tradition, Ponitan died on the tiny island of Tavolara, northeast of the main island of Sardinia. Pope Fabian (236-50) had the remains of Pontian and Hippolytus both brought back to Rome at a later date. Pontian was buried on in the papal crypt of the Catacomb of Callixtus. It would have been the supreme irony if Hippolytus were buried in the same place, which bears the name of his arch-enemy, whom he had called a criminal and heretic, but the Liberian Catalog reports that he was in fact buried on the Via Tiburtina. In 1909, archaeological investigations uncovered the original epitaph of Ponitan in the crypt of Saint Cecilia, near the papal crypt. The epitaph, which takes the same form as the other known epitaphs of the papal crypt, reads: PONTIANOS, EPISK. MARTUR ("Pontianus, Bishop, Martyr"). 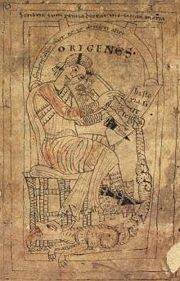 The word mártur, however, was added later by a different hand. His feast day is celebrated jointly with that of Hippolytus on August 13. The reconciliation of the rival congregations of Rome, effected by the joint martyrdoms of pope and antipope, is Pontian's most lasting legacy. This page was last modified on 22 May 2015, at 19:55.